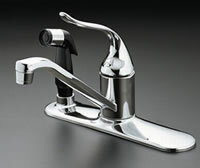 Faucet & Fixture Repair/Replacement - There are many different kinds of faucets available for your home or business. Some faucets have washers, others are washer-less. From leaks and drips to noises, cracks, and clogs, time and continuous use can wear away at even the most ruggedly built faucets and plumbing fixtures. Same Day Drains offers faucet repair and rebuilding, as well as many unique designs for in-home faucet replacement and new installations. We also specialize in many other plumbing repair services throughout Cary, Apex, and Raleigh, so contact us today to schedule your in-home plumbing appointment time or emergency plumbing service call.